The 7 Piece Set includes a Rectangular Double Pedestal Dining Table, 4 Side Chairs and 2 Arm Chairs. Additional side chairs are available as an option. Matching Buffet or Buffet with Hutch are also available. Create a dining room that will impress your dinner guests for years to come with the Saint Charles collection. In the grand European tradition of elegance, this collection is crafted from ash burl veneers and selected hardwoods. Each piece demonstrates delicate craftsmanship and intricate carved detail. 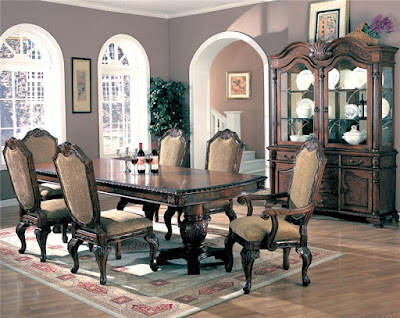 Featuring a double pedestal dining table, arm chairs, side chairs, and a buffet and hutch, this group has the designs to enhance the styling of your dining room. Create a focal point of beauty with the traditional styling of this dining table. The double pedestals and table edges have stunning, intricate detail that are sure to make a sophisticated statement in your dining room. One 24 inch leaf extends the table from 84 inches to 108 inches - perfect for dinner parties or holiday family dinners.